The Estuary Resilience Project is a combination of research, demonstration, and educational outreach projects to address the challenges of flooding, stream and watershed management, and climate change. 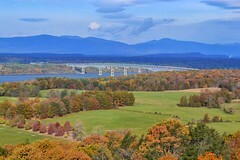 It is a partnership being led by the New York State Water Resources Institute at Cornell University and Cornell Cooperative Extension, with support from the New York State Department of Environmental Conservation’s Hudson River Estuary Program. This project was initiated in summer 2012. Precipitation has been increasing in the northeastern U.S., resulting in many floods on rivers and streams. Climate change models predict that rain in the northeast will fall in more intense events in the future, although it is difficult to predict on a local scale. Sea level rise will also affect the Hudson Estuary. In 2011 and 2012, Hurricane Irene, Tropical Storm Lee, and Superstorm Sandy caused tremendous damage. Private property and public infrastructure in floodplains and along streams and rivers continue to be at risk from future flooding. After devastating storms, landowners and government officials are often left with few popular or acceptable mitigation options to address flooding problems. The public and many officials have a misguided idea that debris removal and dredging, berming, and armoring streams are effective flood prevention and mitigation options. These techniques are often counterproductive, possibly increasing the potential cost of future storm impacts; they do not stop major flooding, create erosive forces upstream and downstream, and may degrade habitat. Local government employees and contractors involved in post-flood response need be trained in stream and floodplain processes, as well as provided with research-based tools to make educated decisions about flood mitigation. It is also important to train municipal officials on the basic functions of floodplains, watershed management, and their roles and responsibilities. Making better land use decisions is a critical tool in reducing the cost and impacts associated with flooding. Follow the links to individual project pages for more information and the complete list of collaborators.